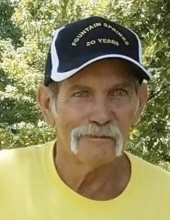 Kenneth Edward (Eddie) Copeland, 68, of Newton NC left this earth for his new home in glory on Wednesday, February 6, 2019 surrounded by his loved ones. He was born July 9, 1950 in Welch, WV. He was the son of the late Kenneth Davis and Opal Burks Copeland. He was employed by CR Lane of Hickory, NC and served our country during the Vietnam War. Eddie was loved by many and will be missed by all of his coworkers and friends. He left a great legacy of a man who helped anyone, loved everyone and showed character at all times. Left to cherish his memory are his wife, Teresa Sigmon Copeland who he married on august 19, 1989. Other survivors include his daughters, Kelly Copeland Dula of Conover, NC, Sabra Copeland of Boone, NC, Lisa Blackburn of Morganton, NC, Julie Ikard of Maiden, NC and Tammy Copeland of Newton, NC. He is also survived by one sister, Helen Marshall (David) of Statesville and one brother, Jerry Copeland (Kathy) of WV. Also left to cherish his memory are 8 grandsons and four great grandsons. In addition to his parents, he was also preceded in death by three brothers, Danny, Jeff and Herbie Copeland, two sisters, Ellen Fox and Karen Copeland. A Celebration of Life will be held at 2:30 p.m. on Saturday, February 16, 2019 at Eufola Baptist Church, 207 Eufola Carriage Road, Statesville, NC. The family will receive friends prior to the service from 1:00- 2:15 p.m. In lieu of flowers, memorials may be made to St Jude Children’s Research Hospital, at www.stjude.org/. Burke Mortuary and Crematory in Newton is serving the Copeland family. To send flowers or a remembrance gift to the family of Kenneth Edward Copeland, please visit our Tribute Store. "Email Address" would like to share the life celebration of Kenneth Edward Copeland. Click on the "link" to go to share a favorite memory or leave a condolence message for the family.